This customer is a large integrator for Telecom and Homeland Security systems. They selected Alexander Schneider to design and manufacture outdoor IT systems that will include servers, Cisco switches, rugged UPS, batteries and fiber communications. The system was to be vandal proof, withstand dust and sand storms and ambient temperatures up to 55oC, and to include an air-conditioning solution for an IT load in excess of 1,000 watts. A quality double wall outdoor cabinet. Rugged UPS to withstand harsh conditions. Modify a COTS air conditioner to suit the application. Electrical design that will interface with local external systems. Design an I/O panel that will maintain the integrity of the IP rating. Design a monitoring system that will allow remote monitoring from an NOC. Our main challenge in this project was the thermal design for extreme weather conditions such as heat, sand storms and direct sun radiation. The Alexanders Schneider team of outdoor experts was able to fulfill all requirements meeting the aggressive deadlines. 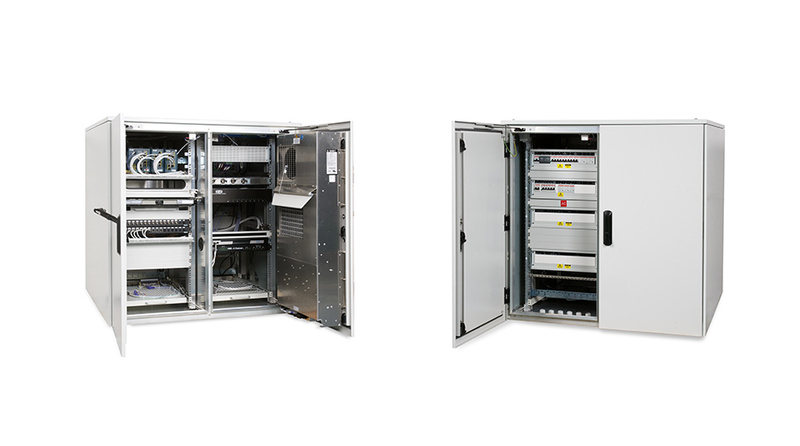 The system cabinets are performing according to design and specifications.